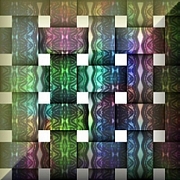 The Flatland Digital Artwork Clip Art Gallery: Afternoon Sunlight on Antique Silk. A weave of lacy ribbons with a silky texture in shades of olive, hunter's green, indigo, aqua, mauve, ice blue, and old rose. the image has a soft golden sheen like light beaming through a window; the ribbons are richly detailed. There's a nostalgic feeling to these colors, which despite their jewel-like hues are very soft and remote. These are bits of fabric woven together by a sheltered young woman in an antique time.